Did you hear? Cody wants to interview me! Good evening to all of my loyal followers. As all of you know, My Dad, the wizard that he is, made the arbitrary decision to adopt another Border collie from Great Lakes Border Collie Rescue. And I’ll be up front about this…I was not consulted. I was not brought into the adoption process until “the day of.” Mmmmmmph. And yes, I have been pouty…wouldn’t any of you? I have been the only dog, My Dad’s dog, since January of 2004. But enough about me. I thought it was time to introduce the new guy to all of my loyal followers and what better way to do that than to interview him…oh yes, his name is M-A-G-I-C. (isn’t that special?) He has respected my subtle messages, like a showing of teeth, or, a showing of teeth with a sudden move toward him. But, I am warming to him. When I bark, he dutifully stands up to see what the problem is. And if he barks, I come over for back-up. We drink out of the same water bowl at the same time. We sleep on the king size bed together with My Dad, I guess that’s Our Dad, we respect each other’s food and snacks – no thievery by either of us. So, let’s get started…we are in My Dad’s office. Cody – What kind of work did you do before you were brought here by My Dad? Magic – Did you get a BusyBone today? Cody – Would an easier question be better? Let’s try this…How old are you? Magic – So have you ever gone bye-bye in the car? Magic – Didn’t you and I each have a BusyBone this morning, right after Our Dad made coffee? Cody – All right, yes I did have a BusyBone…you had one, too…it was still dark outside. Magic – And how old are you? Cody – I will be thirteen years old in January, in about five weeks….WAIT JUST A MINUTE! Magic – What kind of work did you do before you were adopted? Cody – WAIT…WHAT…I JUST ASKED YOU THAT QUESTION! Mmmmm, I was bought by a church to keep geese off their property…and I slept in a garage…and I didn’t do well at that job. Cody – How did you get here? Magic – A lady in a white truck stopped near a store where I was eating garbage, she slipped a rope around my neck and took me for a ride in her truck to a place with a lot of cages and scared dogs. Another man took me in his car to Kathy’s….I liked Kathy, she was nice to me, and her dogs were nice to me, and she fed me and petted me. Kathy was really nice to me. And then you and your Dad took me in your car and I am here, I really like it here. Cody – Do you know how old you are? Magic – I think I’m less than two…Our Dad keeps talking about my teeth, how white and beautiful they are, and I still have urges to do puppy things, like hold on to Our Dad’s fingers with my teeth…gently…is this my forever home? Cody – Yes, I think so….but please pay attention…OK? 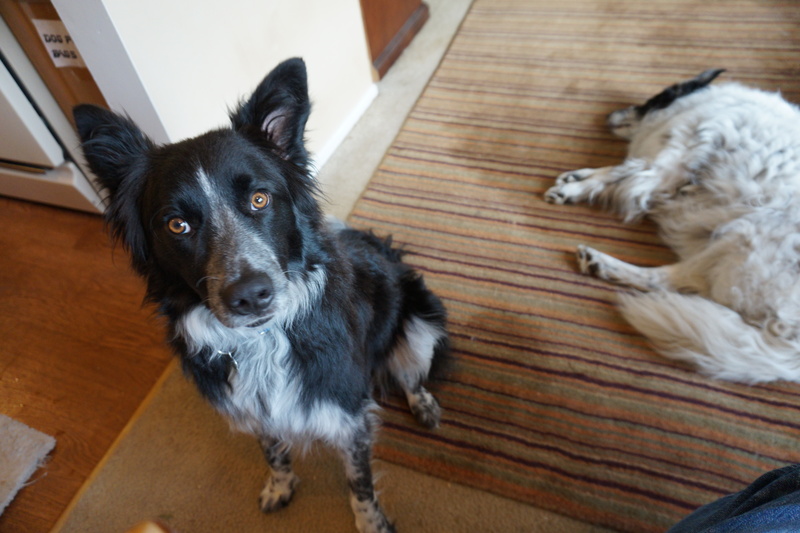 This entry was tagged border collie, border collie rescue, border collies, dog, dog behavior. Bookmark the permalink. Awe! Glad you gave a border collie a home. They are the bestest! Hey MPG, You’re preaching to the choir. BC’s are the best! Great interview, Cody. You gave it your best shot. Magic, big hug and welcome home to you, handsome boy! Cody: It is so nice to see you welcome this young whippersnapper into your home! You and your dad both have a lot of heart…and I know that you will show Magic the “ways of the world”! Cody – you will always be the first BC your Dad got. And being first is always special. Ask your Dad…he was first born. Hi Magic and Cody; just love your perspectives on life. One of my Crew (Mr. Charlie: http://anarette.com/about/the-crew/) was supposed to be a church dog too. I didn’t think that would have worked for him either so I decided to give him a permanent home with us. I know how it goes Cody, we humans get too attached too easily. I love your dog-spirit”:, live in the moment and don’t worry about tomorrow.